'Cities, nations, civilization, progress-it's all over. That game's up. We're beat.' 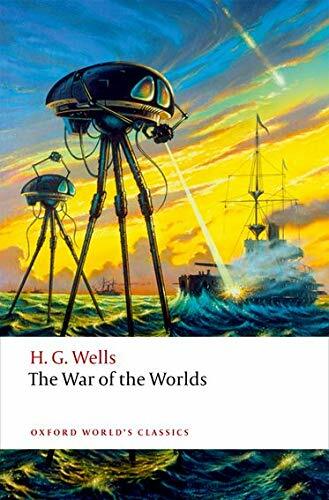 One of the most important and influential invasion narratives ever written, The War of the Worlds (1897) describes the coming of the Martians, who land in Woking, and make their way remorselessly towards the capital, wreaking chaos, death, and destruction., The novel is closely associated with anxiety about a possible invasion of Great Britain at the turn of the century, and concerns about imperial expansion and its impact, and it drew on the latest astronomical knowledge to imagine a desert planet, Mars, turning to Earth for its future. The Martians are also evolutionarily superior to mankind. An interesting and informative foreword and notes by Darryl Jones... I highly recommend these OWC editions ― I find the forewords, without being overly long, pack in a lot of information and add a huge amount to my appreciation of the books. This wonderful series if brought back to life in freshly coloured new UK editions, designed to entrance and engage another generation. Issue 1 of the new series. As collectable, and as readable, as ever. Great for reluctant readers too.